With the increase in compute density making air cooling less and less feasible, liquid cooling is going mainstream. For data centers. Overclockers have been doing it for years. For the most part, liquid cooling involves piping in cooled water to a heat sink attached to the CPU. The water then cools the heat sink, and is pumped away to be circulated and cooled down. But there are some cases where immersion is used. That is where the entire motherboard is submerged in a nonvolatile liquid. Immersion is used in only the most extreme of cases, with the highest compute density and performance. For a variety of reasons, it isn’t widely used. One startup that hopes to change that showed its wares at the Open Compute Project Summit 2019, which ran last week in San Jose. The OCP has a special project called Advanced Cooling Solutions to promote liquid cooling and other advanced cooling approaches. Aimed at data centers, HPC supercomputer applications and hyperscale deployments, SmartPodX makes some major claims. It boasts a Power Usage Effectiveness (PUE) ratios of 1.03 or better, 25 to 30 times more efficient than air cooling and easily the lowest I’ve ever seen. Most air-cooled data centers have a PUE of about 1.8 to 2.0 while liquid-cooled are 1.3 to 1.5. The company also says it can handle compute densities exceeding 100 kW, 10 to 20 times higher per rack footprint, and says it will increase the lifespan of IT hardware by 20% to 50%. 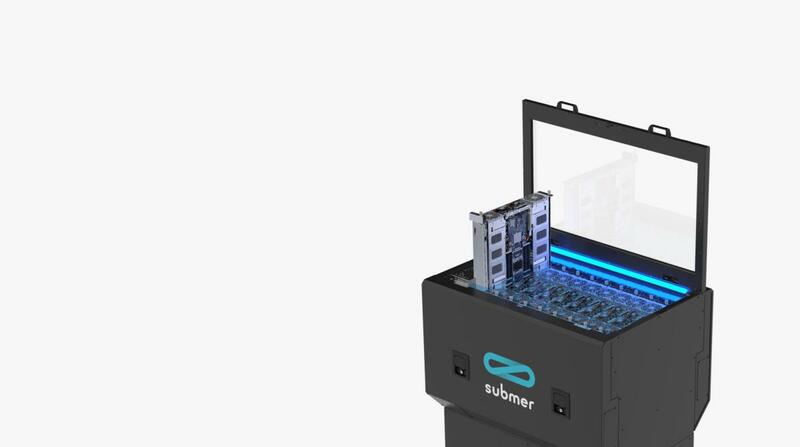 Submer also claims to be the first liquid immersion provider to offer hot swapping, or in this case, what it calls “cool swapping.” Techs can replace hard drives or even entire servers without interrupting operations, which it claims is a first. All of the details on the announcement can be found here. Another startup at the show, ZutaCore, showed off its HyperCool2 technology. 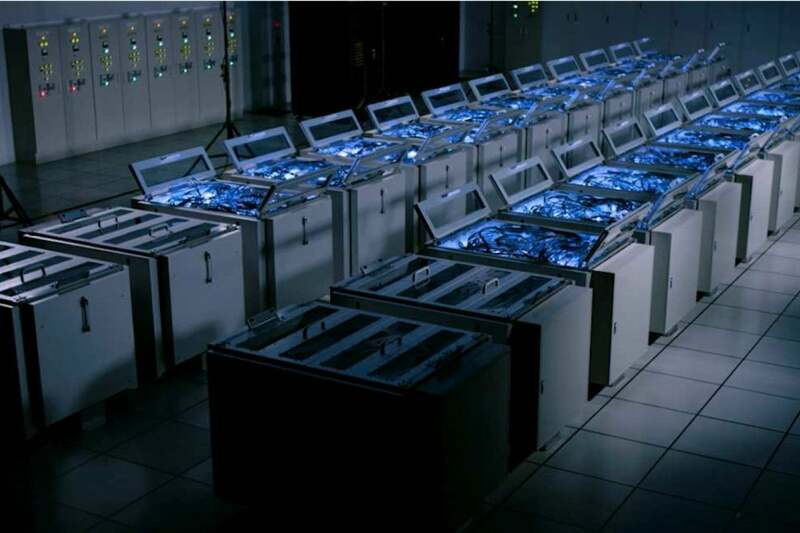 ZutaCore claims its HyperCool2 technology is the first liquid-cooling solution that is compliant with the Open19 standard for data center hardware championed by LinkedIn. ZutaCore is similar to traditional liquid cooling, in that it has an attachment to the CPU where cool liquid comes in and hot liquid goes out. But in this case, ZutaCore uses two-phase cooling, where the heat from the chip is dissipated through liquid contact, and the liquid is vaporized by the heat. ZutaCore’s cooling system consists of a server kit that includes the Enhanced Nucleation Evaporative (ENE) module, a closed loop system that brings coolant to the processor, where it boils to remove the heat. The system also features a Smart-Refrigerant-Distribution Unit (S-RDU) and Smart-Heat-Rejection Unit (S-HRU), and a software package to manage the system. But the big difference is that, rather than water, which is the usual coolant, ZutaCore uses Novec, a dielectric liquid coolant from 3M popular in immersion cooling. That’s because in a water-cooled system, the water actually cools a heat sink that sits on the CPU. With ZutaCore, there is no heat sink. The Novec is piped right onto the chip itself, no middleman, and boils off to cool the chip. No doubt there will be more advances like this as liquid cooling goes mainstream and demand increases.